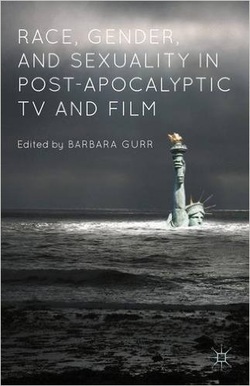 ﻿My latest book chapter is out through Palgrave Macmillan in a collection titled Race, Gender, and Sexuality in Post-Apocalyptic TV and Film, edited by Barbara Gurr. The book examines the production, reproduction, and re-imagination of some of our most deeply held human ideals through sociological, anthropological, historical, and feminist approaches. My chapter critiques masculinism in the apocalyptic genre as seen in film, television and other media. I argue that John Hillcoat’s The Road distinguishes itself from the generic field by empathically unsettling viewers and working against the grain of the tired 'regeneration through violence' trope. "The father remains, almost in a trance. He picks up the couch’s seat cushion from the floor, traces the paisley design that miraculously retained its color, and places it squarely on the couch. He sits down on it. From there he looks at the blank television screen while his reflection is momentarily blotted out by a trickle of water running down. He is so traumatically paralyzed by melancholy that the mise-en-scène weeps for him. In a moment of sensory reengagement, the father becomes possessed by the past. He is not only possessed by his family life, but by the couch and the entire world it signifies that is no longer. The viewer might reflect here on the irony of the couch as a metaphor for late modernity’s creature comforts, the very place where they sit and watch their survival programs, kill zombies on the Xbox, and identify with fantasies of masculine regeneration."